The Poetry and Poetics Colloquium at Northwestern University » 2018 Drinking Gourd Chapbook Poetry Prize Celebration!! 2018 Drinking Gourd Chapbook Poetry Prize Celebration!! 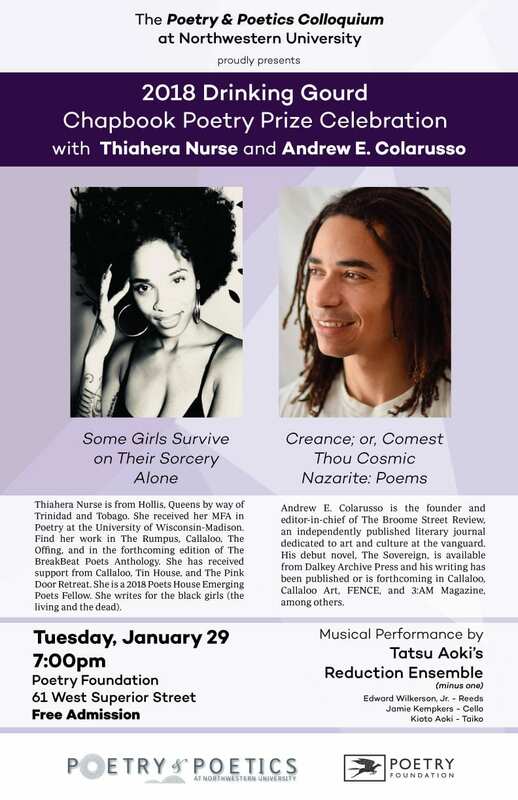 On Tuesday, January 29th, poets Thiahera Nurse & Andrew E. Colarusso will read from their newly released chapbooks: Some Girls Survive on Their Sorcery Alone and Creance; Or, Comest Thou Cosmic Nazarite. Andrew E. Colarusso was born and raised in Brooklyn, NY. 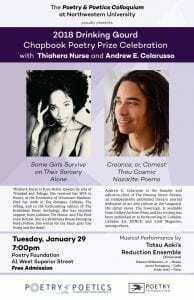 He is currently an assistant professor of literary arts at Brown University. is the founder and editor-in-chief of The Broome Street Review, an independently published literary journal dedicated to art and culture at the vanguard. His debut novel, The Sovereign, is available from Dalkey Archive Press and his writing has been published or is forthcoming in Callaloo, Callaloo Art, FENCE, and 3:AM Magazine, among others. Thiahera Nurse is from Hollis, Queens by way of Trinidad and Tobago. She received her MFA in Poetry at the University of Wisconsin-Madison. Her work can be found in The Rumpus, Callaloo, The Offing, and in the forthcoming edition of The BreakBeat Poets Anthology. She has received support from Callaloo, Tin House, and The Pink Door Retreat. She is a 2018 Poets House Emerging Poets Fellow. She writes for the black girls (the living and the dead). She is an expert in thinking aloud.